Motorists of Independence: There will be no more harassment of people using wheelchairs. Or riding bicycles. Or running. Or walking. Anyone cited for such behavior runs the risk of a $500 fine and jail time. Independence on Monday night became apparently the third Missouri municipality to approve a measure prohibiting such behavior. Columbia and Greenwood, in southern Jackson County, have similar ordinances. Jim Schultz, Independence City Council member, said his concern grew out conversations with residents over the past summer. “I understand that there are some issues with some folks throwing coins, throwing QuikTrip drinks, bottles at not only pedestrians but people in wheelchairs and bicyclists,” Schultz told fellow council members Monday night. Motorists harassing people using wheelchairs? Really? Yes, really, said Schultz, an insurance agent who maintains an office just off Independence Square. 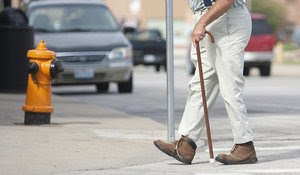 He said he has seen occasional instances of motorists crowding wheelchair users as they tried to navigate crosswalks. Mike Moran, a Vietnam veteran whom Independence motorists often see driving a motorized wheelchair along East 23rd Street, backed Schultz up. “Ninety-eight percent of Independence drivers wave at me,” Moran said. “Then there is the other 2 percent who like to see how close they can get to you. They scream and holler and try to harass you. It’s very strange. Officials in Columbia and Greenwood could not recall anyone appearing in municipal court on ordinance violations. But writing tickets was not the ultimate goal, said Marvin Megee, mayor of Greenwood, which passed its ordinance in May. “In Greenwood it’s all a part of our attempt to create a more friendly community,” Megee said. In Columbia, the extended conversation that the 2009 ordinance prompted may have been more meaningful than the ordinance, said Paul Sturtz, Columbia City Council member. Yet the dialogue had value, Sturtz added. “We understood clearly that it wouldn’t be used by the police very often, but that it would help establish an atmosphere of caution by motorists,” he said. Some of the hostility toward wheelchair users in Independence may stem from a lack of understanding of city code, said Mike Evans, a city resident and wheelchair user who is chairman of the Independence Citizens with Disabilities Advisory Board. Independence code holds that operators of electric personal mobility devices — such as motorized wheelchairs or scooters — should operate with the same rights and duties as pedestrians. That means when sidewalks are not provided and a wheelchair operator must use the roadway, wheelchair users should use the left side of the road or shoulder, facing traffic. Some drivers may be confused by that, Evans said. But there is responsibility for the wheelchair users as well, Evans said. Not all of them, he said, have installed the visibility flag that city code mandates be displayed not less than 6 feet above ground level. “I’ve also seen people use their electric wheelchair or scooters in manner not at all acceptable, such as not crossing at a crosswalk,” he said. Mell Henderson, Mid-America Regional Council transportation director, said he could not think of a similar ordinance on the Kansas side. Members of the area bicycling community were pleased. “It is sad that it has come to this but I guess they are trying to give the police something to work with,” said Laurie Chipman, director of advocacy for the approximately 300-member Kansas City Bicycle Club. Tom Dailey, Independence police chief, said he did not think the ordinance would be challenging to enforce, and described the violation as not much different from an assault. “There usually are witnesses,” he said. City Counselor Allen Garner said most municipalities already had sections of city code that addressed such issues. “But for people behaving badly, we wanted to get one more tool to use,” he said.